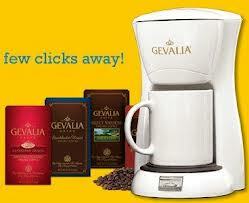 You are here: Home / online shopping / Gevalia: 4 boxes of Gevalia coffee plus a personal coffee maker for $9.99 shipped! 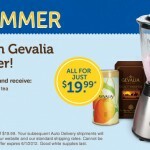 Many readers loved the Gevalia promotion that was available last month. If you missed out on that promotion, but you love coffee, here’s another deal for you! 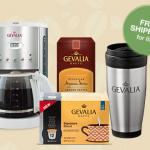 Get 4 boxes of gourmet Gevalia coffee plus a personal coffee maker for just $9.99 shipped! 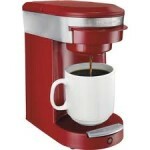 Choose from over 40 coffee flavors or 15 flavors of tea! This would be a great gift for college students or for someone who is on the quick and just wants a quick cup of coffee in the morning but not a whole pot. NOTE: A shipping and handling fee of $5.99 typically applies, but right now they’re offering free shipping, too! You will be enrolled in the Gevalia auto delivery program when you place your order. 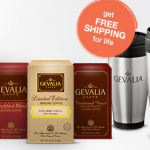 Auto Delivery is a convenient shipping service that allows you to have the Gevalia coffees and teas you choose, delivered to your doorstep on a schedule that’s right for you and you’ll get free samples of teas and coffees as well! If you do not wish to participate in the auto delivery program, you can cancel once you receive your order by calling them at 1-800-GEVALIA. There are no minimum purchase requirements and you can cancel at any time after you receive your order! Readers who have purchased this deal said that it is easy to cancel. Others have chosen to keep their subscription because they love the coffee so much and the prices are great! I got mine the other day! sa-sweeet! chocolate raspberry coffee….mmmm! you can set up your auto delivery of coffee up to like 12 weeks so it doesn’t haven’t to be a monthly thing. how cool is that?! ^_^ I have mine set at 8 weeks. you can change it or cancel anytime. if you want you can cancel after you get this stuff even! 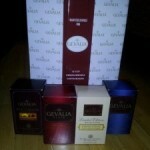 ; ) Though, Gevalia coffee is sooo good! 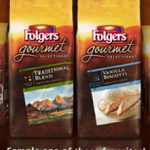 FREE Folgers Gourmet Coffee Samples!